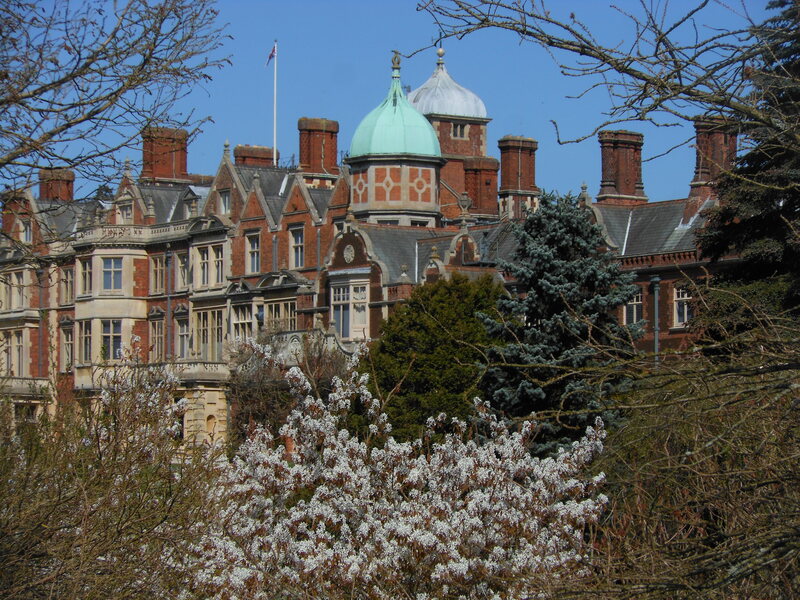 I just read that Queen Elizabeth is resting indoors for the second weekend in a row at her Sandringham home. She didn’t make it to church on Christmas. Now the word is that she may not be well enough to attend services on New Year’s Day either. 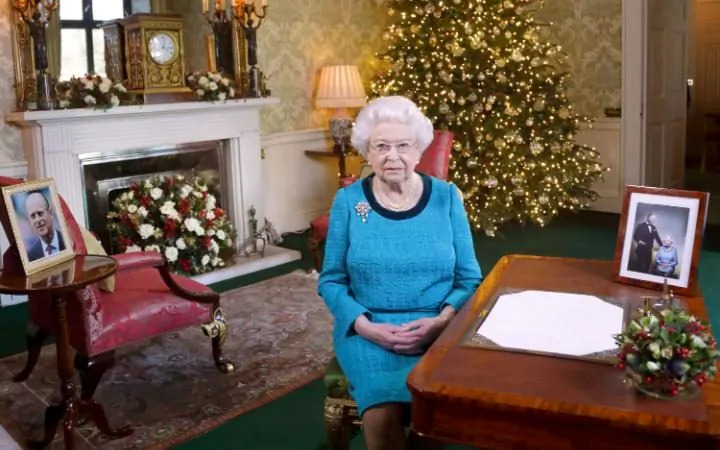 She’s pictured above after delivering her annual Christmas address to the nation (photo from “Telegraph” article cited below). 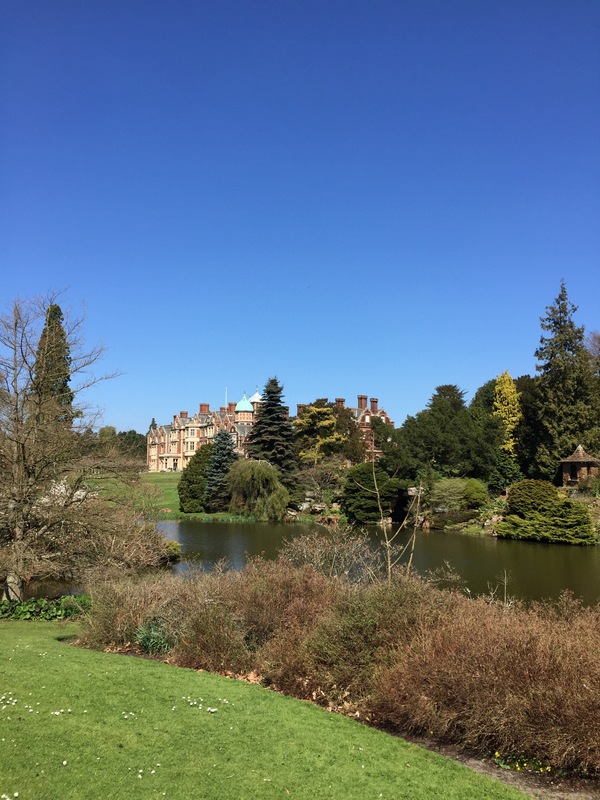 I visited Sandringham about a year and a half ago and was royally wowed. No photos are allowed inside the house, but the grounds and gardens are spectacular. Tourists enter through the same grand door as invited guests. The place is off the beaten tourist track. It’s way in the northern stretches of East Anglia, an area blessedly neglected by travel writers like Rick Steves. It took me many years and many trips to England to finally get there. That is the whole point, for the Royal Family. It is their private, personal residence–a place to really get away from it all. 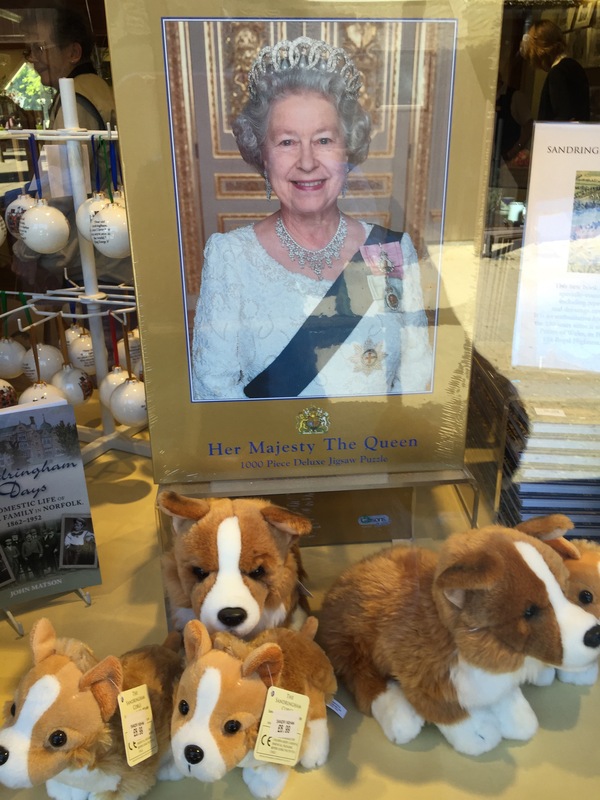 Naturally, there’s a gift shop, well supplied with royal portraits, china, tea towels, and stuffed Corgis. 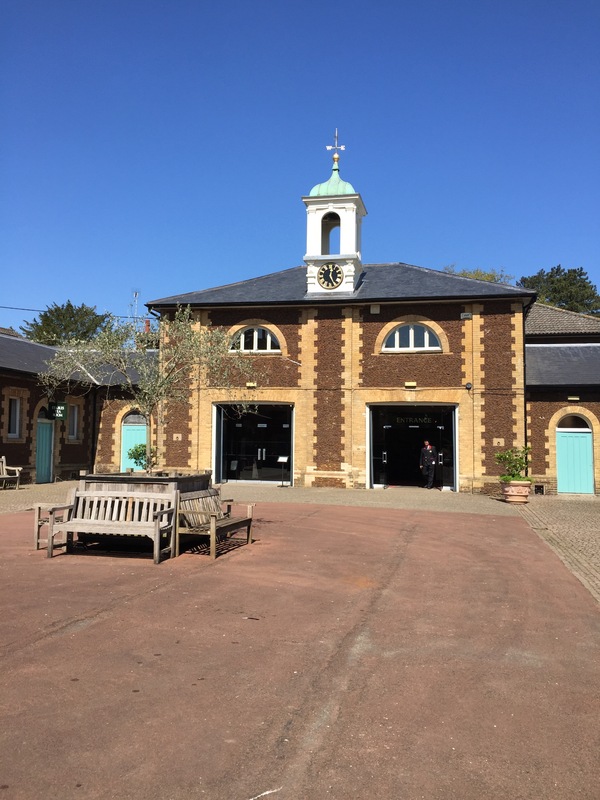 There’s a delightful museum, too, in the old stable block. 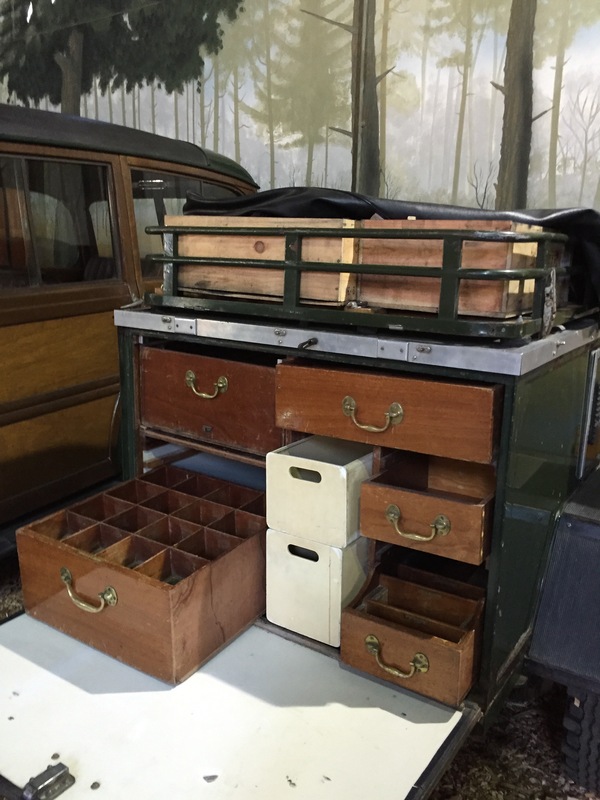 It holds all sorts of bits and bobs of royal life. I was especially charmed to learn that Prince Philip (now 95) is a very decent painter. 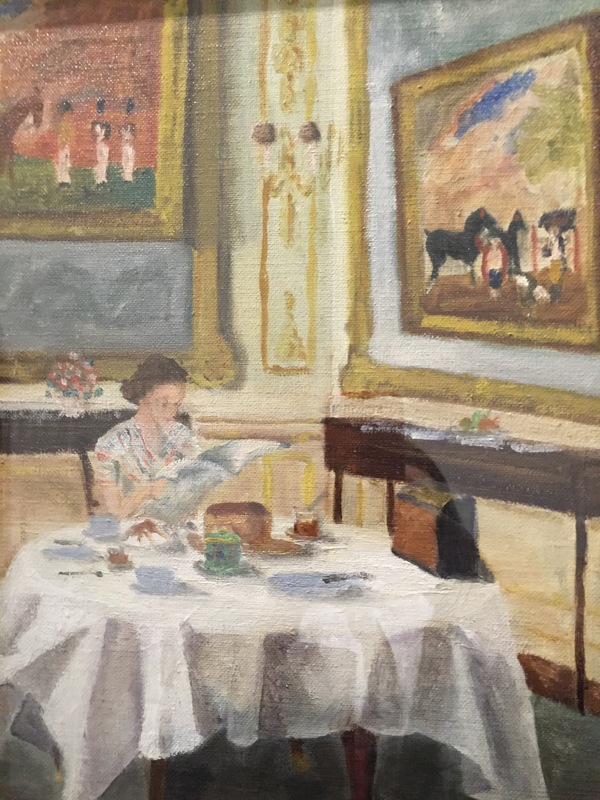 I loved his little painting of the Queen reading the morning papers. 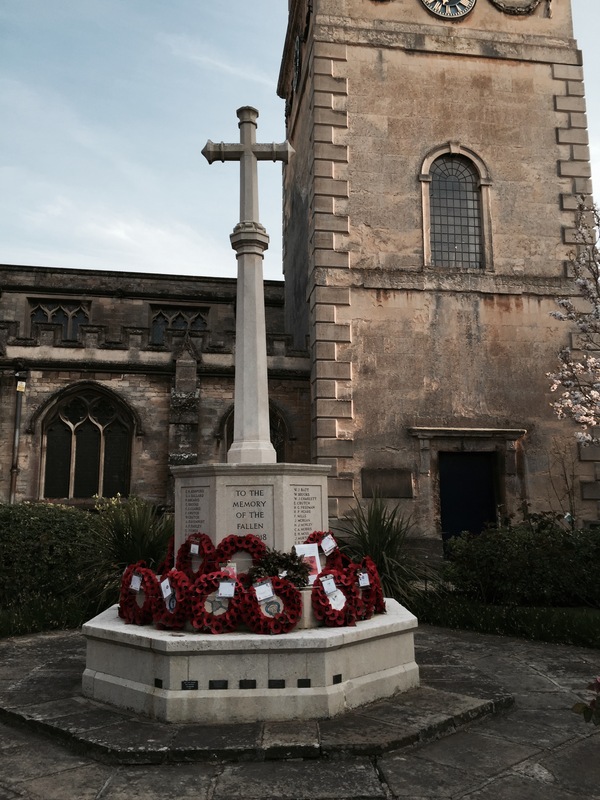 I wrote about the parish church in two previous posts, cited below. It’s one of the most beautiful small churches I’ve ever seen. Each year, locals and a few tourists line up along a fence to watch the royals walk to church on Christmas, and this year on New Year’s Day too. 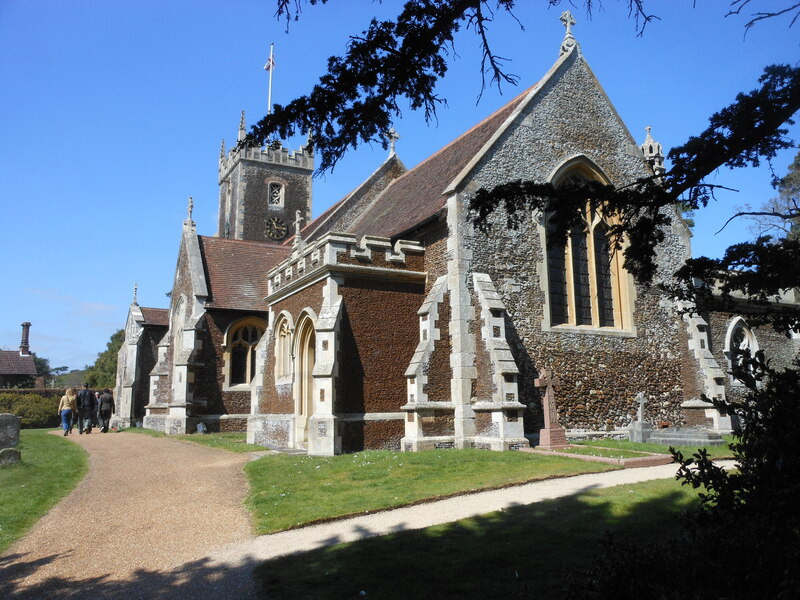 I hope the Queen is well enough to walk over to her pretty little local church and take part in prayers for New Year’s Day. Whether she makes it to church or not, I wish my favorite 90-year-old reigning queen a happy and healthy 2017. 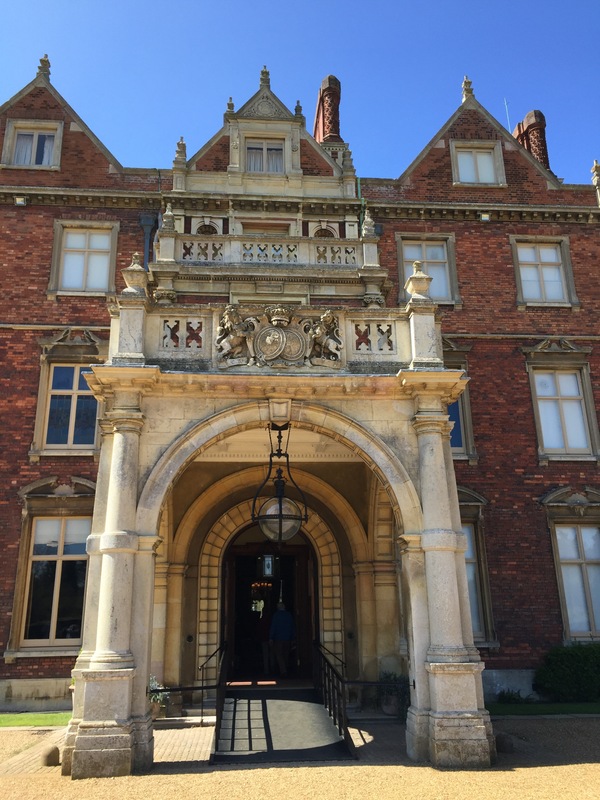 This entry was posted in British Isles, Cathedrals and Churches, England, Historic Homes, Why I Love England and tagged Church of Mary Magdelene at Sandringham, Queen Elizabeth II, Sandringham House on December 31, 2016 by Claudia Suzan Carley. No More Red Boxes? What Would Disraeli Say? At Hughenden Manor last spring, I was thrilled to spot Prime Minister Disraeli’s famous “red box” in his study. It’s a kind of box used for the last 150 years or so by British government officials. It’s really just a briefcase, but so much more romantic–and quintessentially British. These boxes were first used in the 1860s. They were covered in red-dyed rams’ leather, embossed with the Royal Cypher and lined with lead–reportedly so that if the carrier were captured at sea, the box would sink with all its secrets intact. The lead also made the boxes pretty strong in the event of bombing or other catastrophe. The lock is on the bottom of the box, guaranteeing that nobody will walk off without locking it. (Does anyone ever forget, grab the handle and spill the important documents? Let’s hope not). Until very recently, important government officials proudly carried their red boxes wherever they went. (Naturally, a government official is always hard at work, so the box is necessary at all times). Any man or woman would walk a little taller carrying the jaunty red case. And what a status symbol to casually place on one’s table on the train! 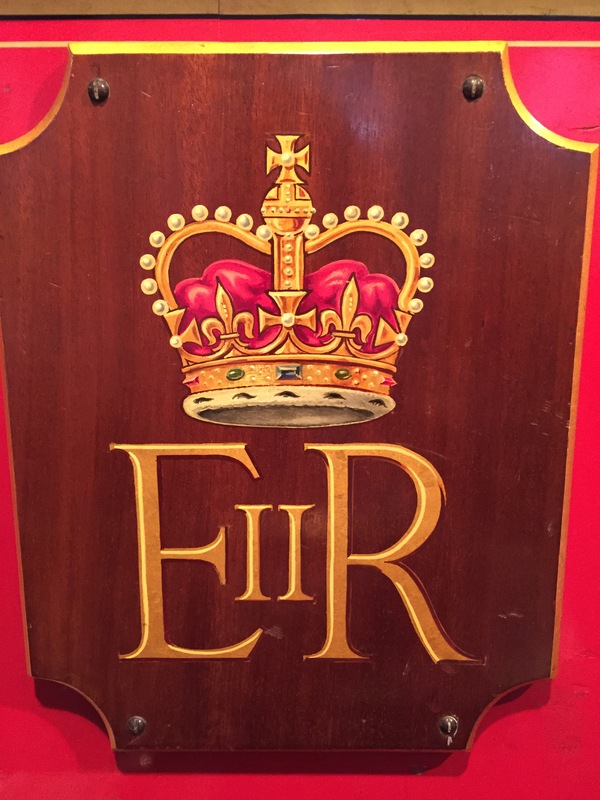 Queen Elizabeth, like Disraeli’s Queen Victoria, receives her own royal red box daily. It contains documents the sovereign must sign before they become law. I’d like to think the Queen’s red box will exist for a long time. So in England, red ministerial boxes are going the way of red curbside telephone boxes. Prime Minister Benjamin Disraeli lived in a slower-moving world. His red box came with him to his country home, where he worked in his quiet study between long walks inspecting his grounds. There was time for him to think, to read actual books, to reflect on the weighty problems of state. I fear that Britain’s government ministers will now be more like the rest of us: constantly intent on a pocket-sized screen. Somehow, I can’t see the elegant Mr. Disrael hunched over a smartphone. I wouldn’t give up my own smartphone for anything, of course. It’s my only camera, as well as my window into the wider world. I can look up most anything with a few thumbstrokes. But if I were a British government minister, I would miss my elegant red ramskin box with the Royal Cypher and the lock on the bottom. This entry was posted in British Isles, England, Historic Homes, Historical Figures, History, Why I Love England and tagged Benjamin Disraeli, British ministerial boxes, British red boxes phasing out, Hughenden Manor, Queen Elizabeth II, Queen Victoria on February 26, 2016 by Claudia Suzan Carley. Britain’s beloved Queen Victoria died on January 22, 1901, ending the Victorian Era. She was also Empress of India all through the heyday of the years when the sun never set on the British Empire. Her image still appears everywhere in Great Britain. The coronation portrait by George Hayter is in the Royal Collection (Public Domain now). It still appears in reproductions in some tradition-loving British homes. Other homes display mass-produced images like the one above, spotted in the very regal Wimpole Estate. Victoria’s image, dressed in black in her widowhood and with her little diamond crown perched on top of her head, is instantly recognizable. The little model above holds pride of place in an exhibit of military models at Blenheim Palace. That unusual crown served as a canny early version of a prominent person creating a unique brand for herself. How did Victoria see herself? The sketch above, Public Domain, was Victoria’s own self-portrait as a young girl. She already has some kind of little whatsit balancing on top of her head. She looks apprehensive. But when she unexpectedly took the throne at the age of 18, after everyone else in the line of succession had died, she rose to the occasion and she kept rising. She reigned over England for over 63 years. We tend to think of Victoria as a dour old lady. But in fact she laughed often. The Public Domain photo above shows her in a jolly mood, even into her old age. A statue of Victoria stands serenely at the entrance of Windsor Castle, the thousand-year-old complex that is one of the favorite homes of the current Queen. Queen Elizabeth II has now reigned longer than her ancestor, the redoubtable Victoria. Whatever one thinks of the institution of the monarchy, there’s no doubt that Queen Elizabeth is a cracking good Queen. 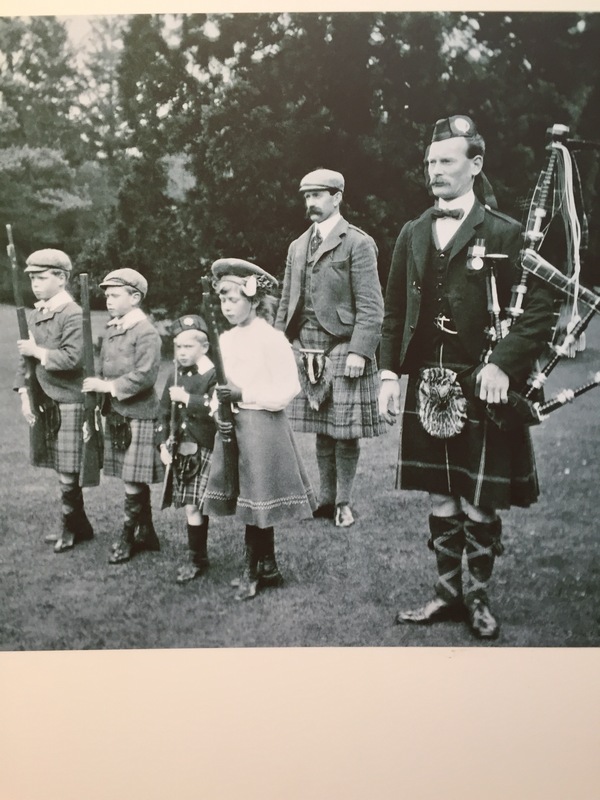 The photo above is from the shop at Sandringham, the country estate in Norfolk that Queen Victoria wisely bought as a private retreat for the Windsors. When I was there, neither the Queen nor her Corgis were in sight, but their presence was felt everywhere. 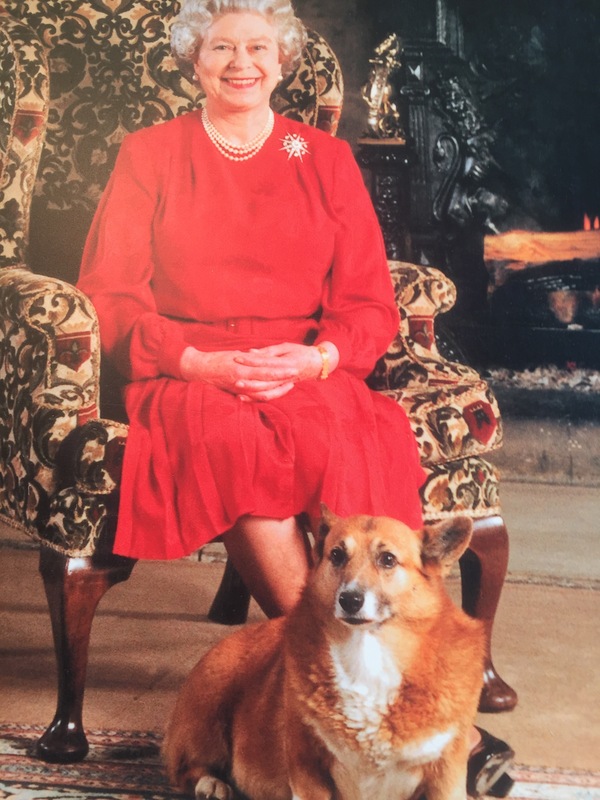 There’s nothing more British than the Queen and her beloved Corgis. I wish them all well. Join me next time for more exploration in the art and history of Europe and the British Isles! This entry was posted in British Isles, Castles and Palaces, England, Historic Homes, Historical Figures, Why I Love England and tagged Queen Elizabeth II, Queen Victoria, Queen's corgis on January 22, 2016 by Claudia Suzan Carley. It seems that anyone in England who owns a patch of ground, large or small, is compelled to make it into a thing of beauty or an expression of taste. English gardeners use flowers as a painter uses color. And an English garden is more than just pretty flowers. It’s also a place to display the imagination and wit of the gardener. Do you have an unsightly stump with a horizontal lean to it? Turn it into a six-foot earthworm to greet your guests. This one is at the entrance to The Vyne, a National Trust house from the Tudor era. I’m pretty sure the earthworm was a modern gardener’s idea. Maybe your stump is more vertical. 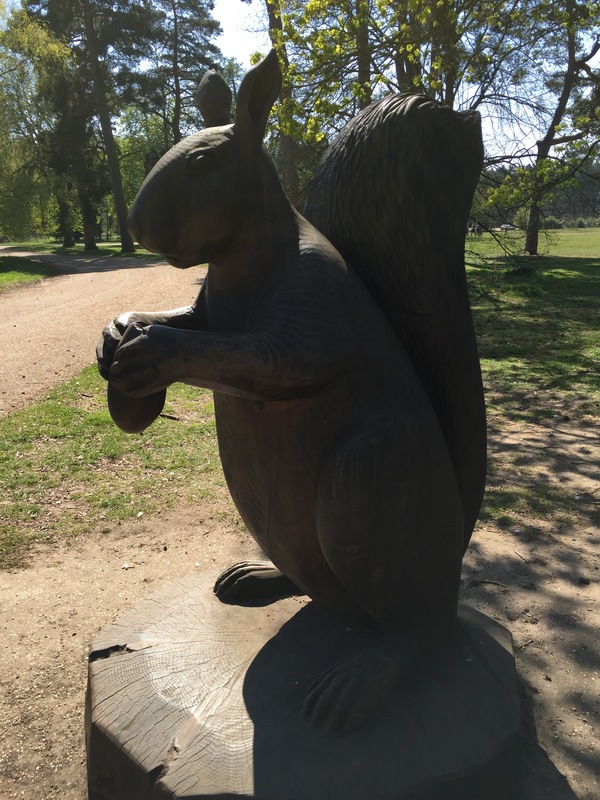 The Queen turned one of hers into a giant squirrel at Sandringham, the private country estate of the Royal Family near King’s Lynn. The squirrel stands about eight feet tall. Do children climb on it? There’s nothing to stop them except decorum–maybe the Queen will walk by. Do you have a boring expanse of lawn? 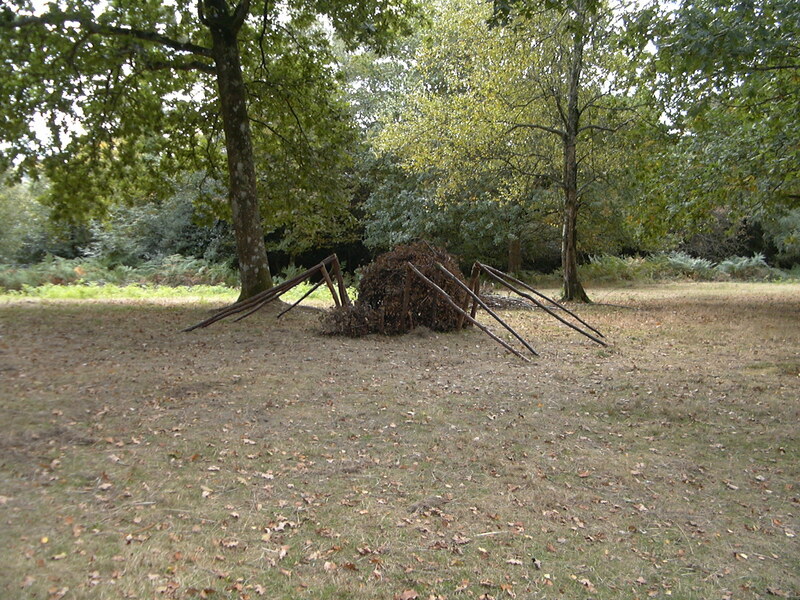 How about a creepy-crawly spider? This one, about a thousand times larger than life-size, is at Sudeley Castle. 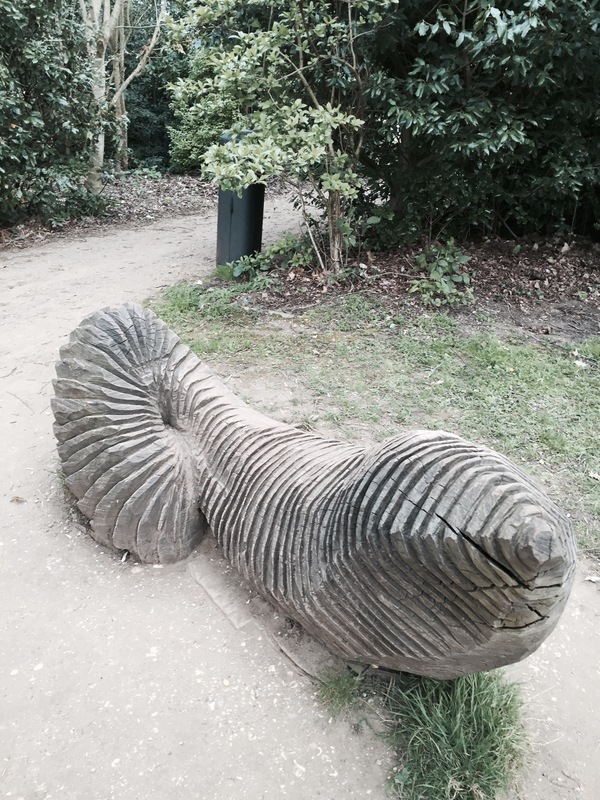 Sometimes garden ornaments touchingly describe history. 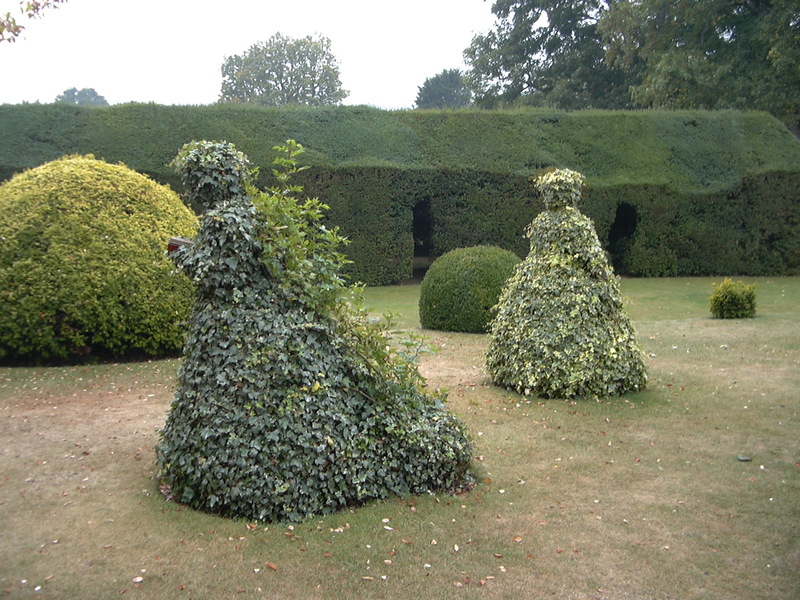 Sudeley Castle has exquisite ivy garden sculptures depicting Queen Catherine Parr and her younger relative Lady Jane Grey, two queens who lived at Sudeley together for a time. Later, Lady Jane reigned as Queen for only nine days. The political machinations that put her on the throne brought her down quickly and she lost her head. Queen Catherine was the only wife to survive Henry VIII. 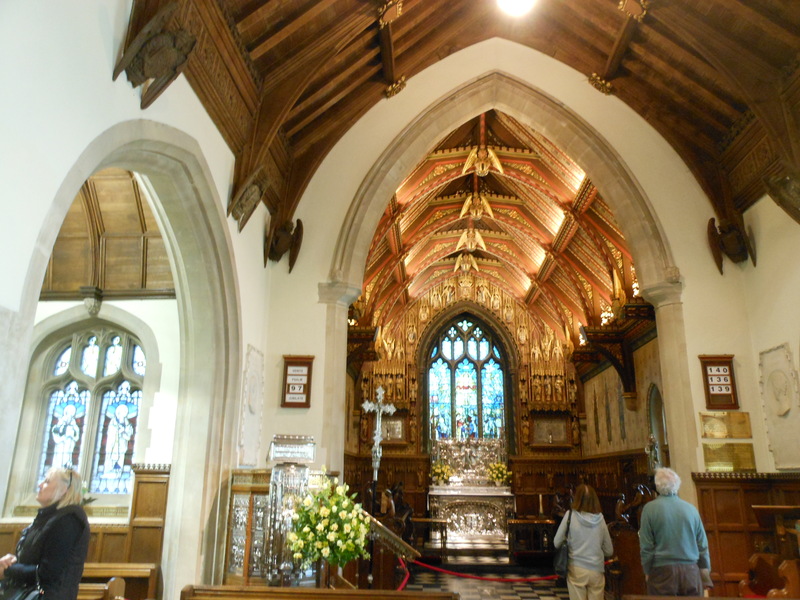 She is buried in the nearby chapel where she and Lady Jane went daily to pray. History is everywhere in English gardens. At Sudeley, antique roses are lovingly cultivated outside the castle where the 15-year-old Elizabeth, later Queen Elizabeth I, once had to fend off the advances of Thomas Seymour. Baron Seymour, always on the lookout for the main chance, eventually married Queen Catherine Parr after Henry VIII died. Sadly, Baron Seymour’s ambition proved his undoing and he was later executed for treason. It seems that Elizabeth wisely avoided him after Catherine died. Elizabeth had suitors enough without this particular bad boy. 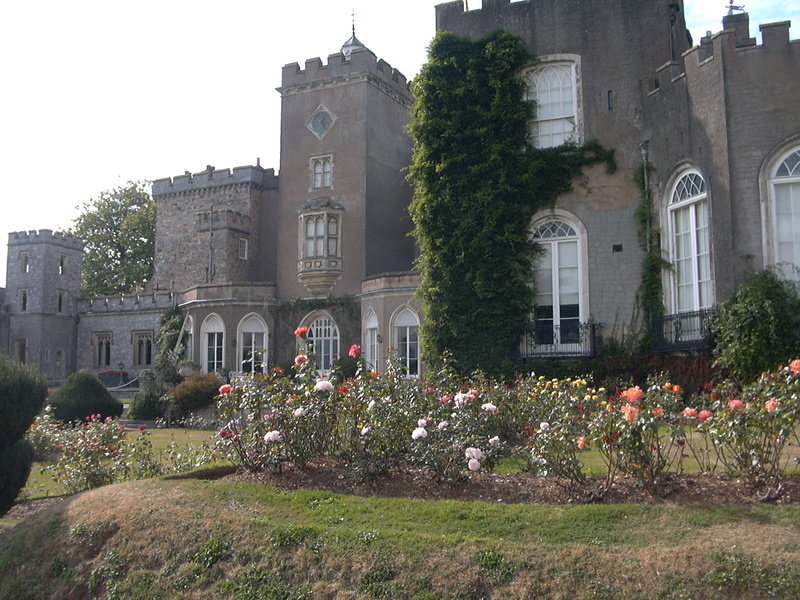 If your brother was the fabulously rich Baron de Rothschild and he built himself a French chateau in the English countryside, then put you in charge of the grounds, what would you come up with? 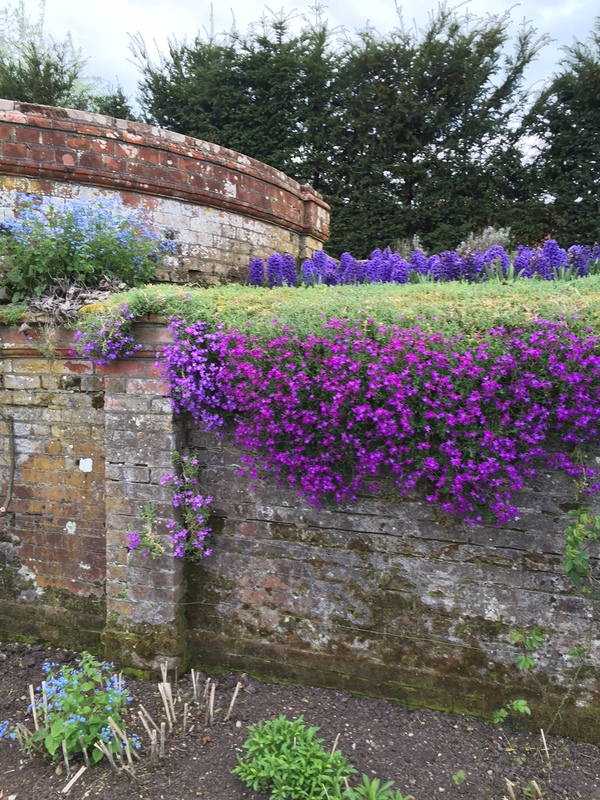 Baron de Rothschild’s sister Alice invented “vertical gardening” at Waddesdon Manor. 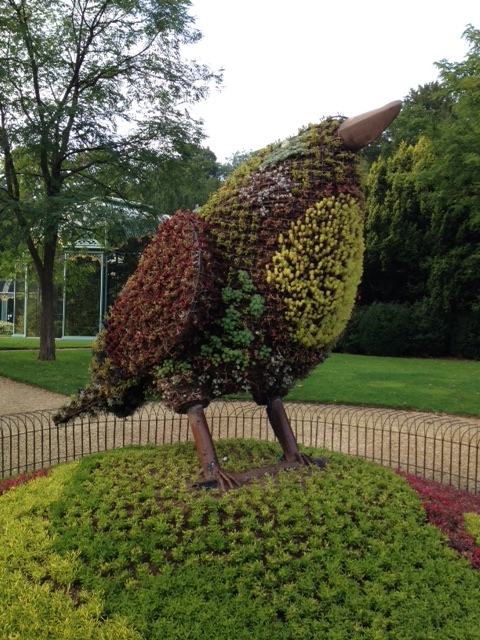 This bird, studded with colored plants in early spring, is about 8 feet tall. Like her mega-rich brother, Alice liked to do things in a big way. I’d love to be wandering in an English garden right now, looking for discoveries through the next garden gate. 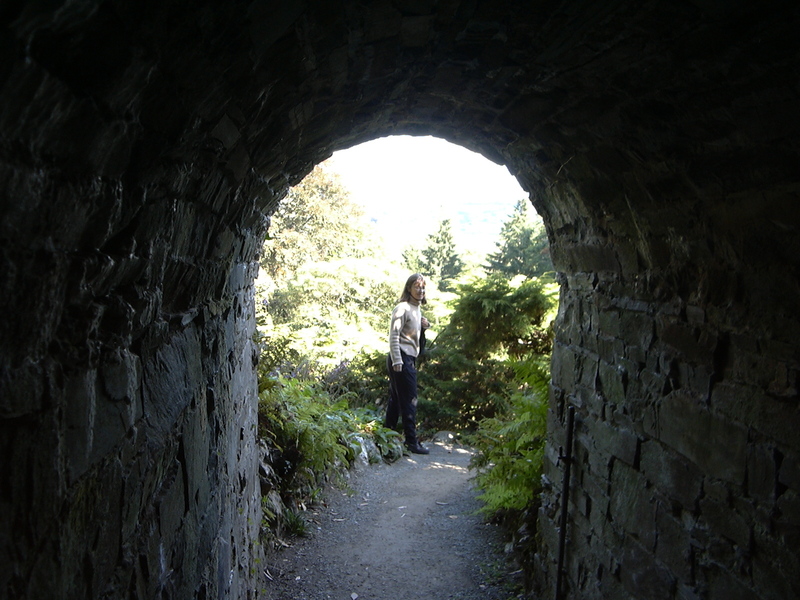 Join me next time for more explorations in the art and history of Europe and the British Isles! 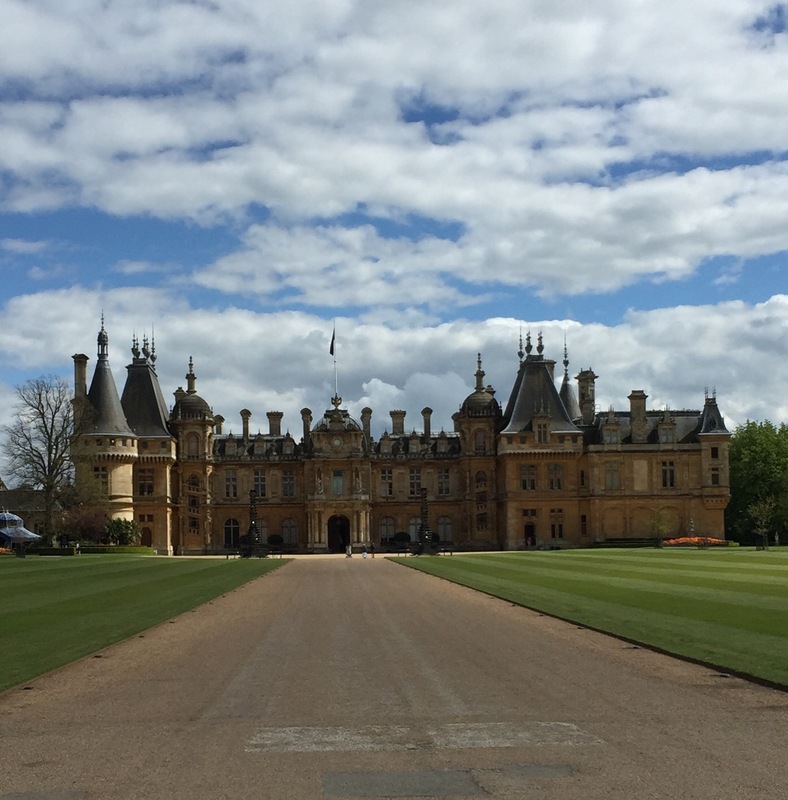 This entry was posted in British Isles, England, Why I Love England and tagged Alice Rothschild, Baron Rothschild, Baron Thomas Seymour, English garden features, Lady Jane Grey, Queen Catherine Parr, Queen Elizabeth I, Queen Elizabeth II, Sandringham, Sudeley Castle, Waddesdon Manor on June 14, 2015 by Claudia Suzan Carley. 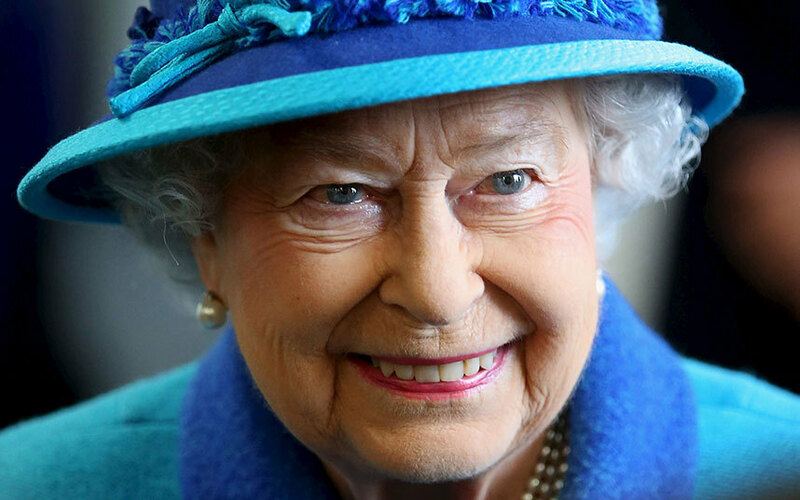 Today is Queen Elizabeth II’s birthday: 89 years young, and still going strong. Were there big birthday celebrations? No, because Elizabeth very sensibly prefers to celebrate in June, when the weather is usually better. Her official birthday involves any number of soldiers, dignitaries, retainers and nobles on parade, so it’s not just her own personal comfort that concerns the Queen. 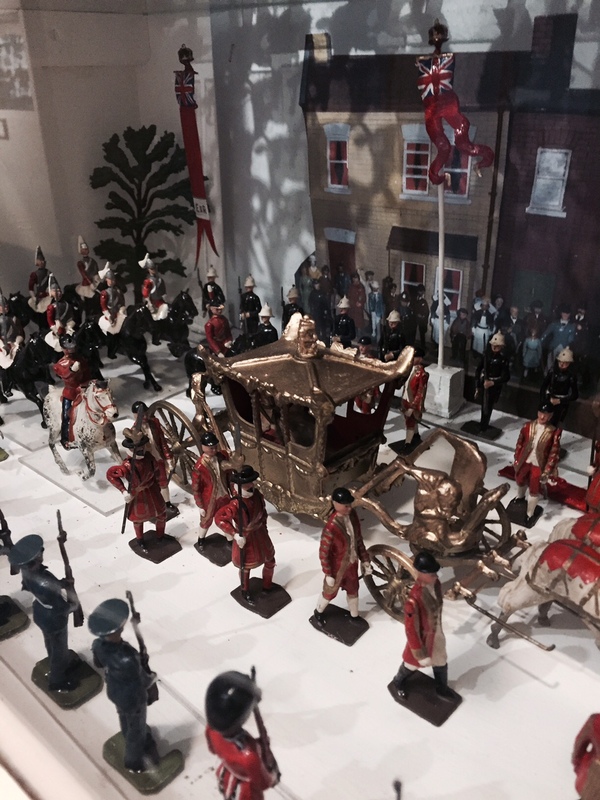 The models above are on display at Blenheim Palace. They depict a royal Jubilee procession. When in England, I consider myself an honorary Brit. So I didn’t mind when the carillon bells in the church tower next to the place where I’m staying rang out for about 5 minutes on the hour and half-hour all day long. And I’m waiting breathlessly for word of a new royal grandbaby any day now. This entry was posted in British Isles, England and tagged Queen Elizabeth II on April 21, 2015 by Claudia Suzan Carley.